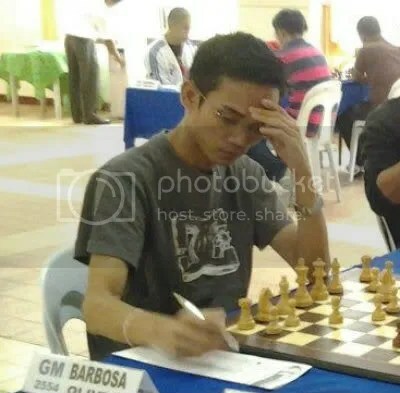 Up-and-coming young grandmaster from Rizal Province, Philippines Oliver Barbosa nailed the 5th and last qualification ticket for the Chess World Cup (CWC) 2013 in the just concluded Asian Continental Chess (ACC) Championship 2012 in Ho Chi Minh, Vietnam last 5-13 May 2012. The CWC 2013 is a 128-player single-elimination tournament scheduled on 10 August to 5 September 2013 in Tromso, Norway. The winner and the runner up of the World Cup 2013 will qualify to the Candidates stage of the World Championship cycle 2012-2014. ACC 2012 is just one of the qualifying events for Asian players in the CWC 2013. Asia is allotted a total of 20 qualifiers. There will be another ACC 2013 in Indonesia and additionally, Asian Zonal events still to be scheduled. Barbwire as fondly called by his fans, actually, finished the 9-round Swiss System “Standard” chess tournament scoring 6.0/9 (5wins-2draws-2losses) points and tied with 6 other players @ 4th-10th places but after the tie-break points been applied got the 5th place, the last berth of the five CWC 2013 qualification slots programmed in the event. Wesley So, another player from the Philippines, also scored 6.0/9 (3wins & 6draws) but missed the cut with lower tie-break points and finished at 8th place. Barbosa’s 5-victims in the tournament were GM Tu Hoang Thong VIE (R-2), Yu Ruiyuan CHN (R-3), FM Novita Anjas (R-4), GM Susano Megaranto INA (R-6) and GM Lu Shanglei CHN (R-7). He got 2-draws with countryman IM Garcia Jan Emmanuel (R-1) and GM Ding Liren CHN(R-9). His 2-losses were to the eventual 2nd placer GM Yu Yanggi CHN(R-5) and 1st placer Negi Parimarjan IND(R-8). are 3rd placer GM Salem A R Saleh UAE with 6.5/9 and 4th placer IM Liu Qingnan CHN with 6.0/9. cogratulations Oliver. from Cebu city, we love you always pray for your success. congrats idol more winning to come. congrats master! manalo t matalo sau parin kami!